BPI Mobile Wallet: Shop & Dine using your PHONE!! Last Thursday, I attended one of the most intimate but really remarkable events ever. The experience was quite unique, where the people from BPI invited us to have a quick milk tea break at Serenitea Robinsons Galleria to discuss to us their newest innovation that will change the way people shop and dine..
BPI, being the leader in mobile banking launched their newest innovation with the goal of making customers's over-the-counter experience a lot more fun and easy. Technically, the device uses Near Field Communication, where the mobile wallet install a device on a smartphone (IPhone 4S in iOs 4 & 5, Blackberry 8520, 9770, 9780 and other latest models and selected android phones) and turn it to a virtual wallet! Let me show you how we used it when we ordered our drinks at Serenitea. Instead of pulling out bills from the wallet, you just have to open your phone (which I'm sure we always hold no matter what), and open the BPI Mobile App. Just tap the phone (with the application app open) on the terminal, and voila! Transaction done! just like your usual ATMS (if you're fond of using EPS like I do), you can always check your balance on your mobile wallet! In case you run out of balance, just reload it using the express online App. The maximum amount on the BPI Mobile wallet is Php10,000 per reload. The Micro SD will be inserted in the Blackberry phone along with this back cover (with the special tape for protection of the micro chip). This device will be given to interested applicants for free, just load a minimum amount of P2000 to experience cashless shopping! While Iphone users will be given a special casing that can hold and connect the device to the phone. This casing will be given for free (for a limited time) for interested clients. Bloggers really interested on learning more BPI Mobile Wallet. For a heavy EPS user like me (I don't like carrying a lot of cash in my bag), I got really excited with this innovation. Honestly, I love the ease of using EPS / Debit shopping for it saves me time from withrawing from the ATM if I run out of cash. So when I learn that I can do shopping using my mobile phone, I got a lot more excited. Moreover, even RESTAURANT establishments also accepts BPI Mobile Wallet transactions which will definitely make dining with ease. Other than the Mobile Wallet App, BPI currently offers electronic banking through BPI Express Online, BPI Express Mobile, and BPI Express Phone. 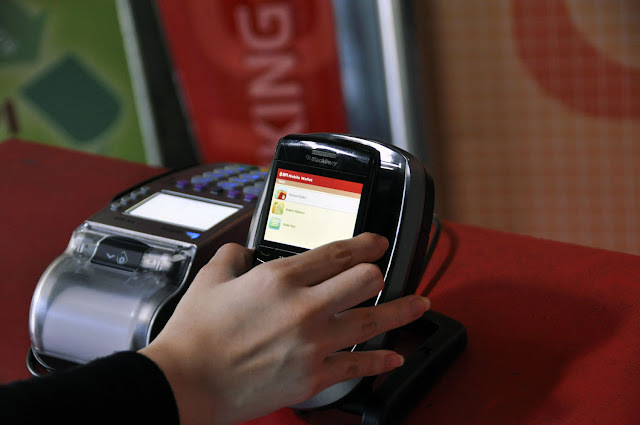 BPI also has existing electronic payments through its Credit Cards, EPS, and the BPI Mobile Mall java app. For more information about the different electronic services BPI has to offer, visit www.bpiexpressonline.com. These one's really interesting and makes shopping and dining a lot easier. nice to know about BPI mobile wallet.